I joined Influenster in December of 2011 with the hopes of trying new products. I had just began the wonderful adventure of blogging and was eager to try new things and connect with other people. I remember the day my 1st voxbox arrived, it felt like Christmas, I immediately grabbed my camera and started snapping pictures of the opening process and products. Then came the fun part of trying the products, Whether it was a new dish soap, mascara, nail polish or candy, trying the product and documenting my opinion on it. After that I write up a review, add some pictures and then share with the world. My favorite VoxBox has to be the Jadore Voxbox 2014. FrizzEase and Lashes and Kisses ,Oh My!!! This was by far my favorite box. After trying all the products I had to run out and get some full sizes! Some of these items I would of never tried let alone bought. The Influenster site is by far my favorite! Not only you can look at reviews of different items but you can review them also. You can ask and answer questions and rate the items. As well as connect with social media and gain points,earn badges or even just hang out in The Hub. Whenever I go shopping I make sure the Influenster app is ready to go. Influenster became one of my favorite site very fast. To have a company that wants to send me stuff for free to write my opinion and share it with the word is priceless to me. I can't believe it.. it seems it was an eternity since I worked so hard on this blog, bringing my faithful readers lots of different companies, products and makeup ideas.. For those who will still read this, I am sorry I left for so long. After my dad died and I became homeless and depressed, it was hard for me to get up in the morning let alone blog about anything. I was in a very very dark place for a long time and didn't know how to pull myself out of it. Now things have turned around and I feel like a brand new person. After over a year living in a hotel, being so broke and broken I have moved into a house with my brother , his girlfriend and my boyfriend. I have gotten a job which I love, and I am mentally healthy again. I have always loved and still love makeup and have missed sharing my looks and reviews with everyone. I am still working on setting up my makeup table and getting everything situated but I will be starting PHLF again!!! It'll be a slow start but I will get up and running again.. I think I will also use this blog for fashion and jewelry also! Stay tuned!!! I am also cleaning up this blog and getting rid of a lot of older posts! Its time for a fresh start! 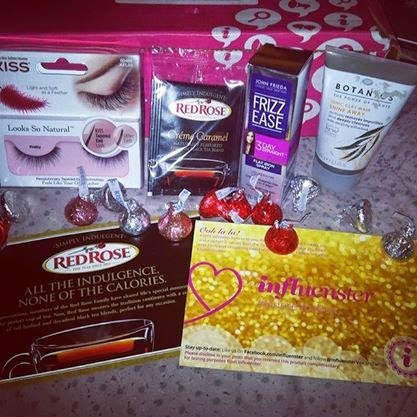 I was lucky enough to be able to participate in the Valentines Voxbox from Influenster! When I opened it I was so happy and surprised to see all the goodies!! I don't have anything bad to say about this box.. Its wonderful! The kisses... went nuts on those.. I shared them with my boyfriend! The Lashes are lovely. John Frieda never lets me down. Rosered tea is my favorite and the Lemon Chiffon was the most delicious tea I have ever tasted! The Face mask and my face have fallin in love and got married! I received Sally Hansens Total Knockout Manicure System from Influenster and I love it.. Not only the colors are vibrant and lovely.. They apply easy because of the amazing brush. and they also dry super quick and last awhile. The only thing I did not like was the one color Jaded.. That is more of a personal thing than anything.. I didnt like the color. I bet you are asking if I would buy myself.. Yes.. I will have many more colors soon! ( This is a stock photo - I am getting ready to move and all my nailpolish is in the new place. **Disclaimer- I recieved all products from Influenster for review purposes. When I received the MaryKay voxbox I didn't even know it shipped yet, so it was a surprise! I was kind of disappointing that the box was crushed a bit, but that's the postal service not MaryKay or Influenster. I immediately opened the box. At first glance I have to say I am impressed by the presentation. There were 5 full size products inside. Each were in individual boxes and the brush came in a case. Very cute and classy. There was also a product card, a giveaway opportunity and a MaryKay catalog. * LASHilious! Long. Strong. Seriously separated lashes. * The perfect brush for applying any cream product. * Dramatic Definition.Fuller looking lashes. Now I have used MaryKay products in the past and they never disappoint. When I was younger it never appealed to me because I always had the impression that its old ladyish. I do believe if they offered a selection of brighter colors they might appeal to a younger crowd. That aside I was impressed by how much I like the products. It would of been nice if they put a few samples such as perfume because I didn't even know that they offered perfume. I have to say I really like the packaging , very clean , classy and sleek. The prices are a bit on the pricey side for me, along the same pricing as MAC. I tend not to by pricey makeup for 1 I can't afford it and 2 because I have so much makeup that buying high priced makeup isn't really a smart idea , but for someone that needs a set of makeup for their everyday I would defiantly suggest making the MaryKay investment. You will get a good quality makeup that will last. I am in love with the Lash Lengthening and the Lash primer. They work incredibly well and look great. As far as everything else. The brush is nice, very sturdy and easy to use, and the price is good! The Cream eyecolor is a fantastic color but I really don't like cream shadows personally. It would never be something that I would buy myself. but as far as they actual product, it's easy to use and dries pretty quickly. Now for the lipstick. Love the color,don't like the fact its lipstick. I don't wear lipstick, it never looks right on me. This lipstick is very creamy and a good formula but I never wore it out of my place. Would I buy MaryKay products? I am still kind of on the fence. I don't see many products that I would like but I probably would give it a try and meet up with a consultant to try some stuff out. MK is a quality product for a decent price. A small town gal giving her 2 cents on all things makeup!! All content in this blog by Christa Roze (Gunnmetal27) is Copyright Protected. Simple theme. Powered by Blogger.